As often seems to happen, they've painted themselves into a corner with appearances. For the Officer class, this mostly means uniform color, pauldrons, and armor (or lack thereof). Officers' skins need additional uniform color options, armored options at higher ranks, and pauldron options to show rank visually with armor. 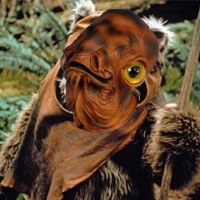 So, let's start with the easy ones: simple canon color-swaps that actually create meaningful alternate appearances. This means uniforms. These need tweaks anyway, as one function of uniform color is to distinguish one faction's Officers from its opposing faction's Officers, yet the officers of the First Order and the Resistance (black and dark brown) look pretty similar at a glance. 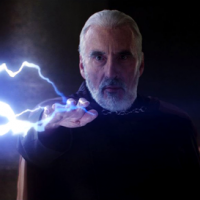 Simply lightening the Resistance uniform a bit would resolve this, but the other color options would help. The other function of Officer uniform color is to show rank. In the game this can translate to class rank, and serve as a visual badge of achievement. The current default uniforms have only one color per faction, and for some reason the colors chosen are often high-ranking officers instead of low. So, to set up a good Officer customization system, the first task is to change the defaults. 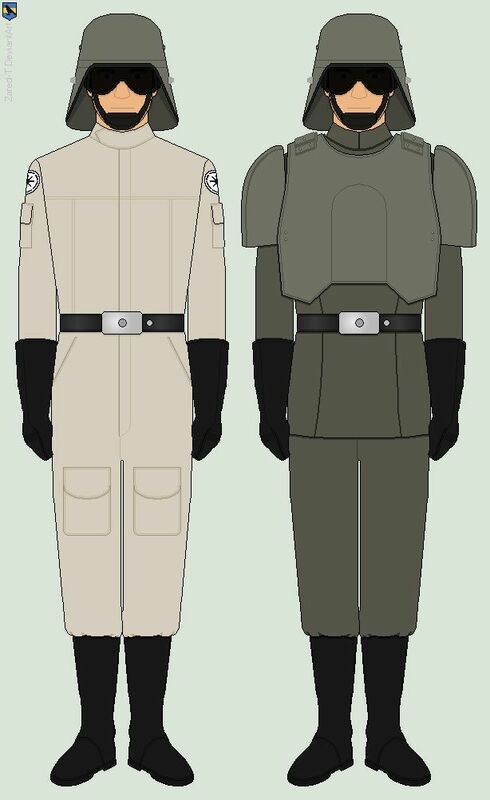 The Clone Officer uniforms in canon are the least diverse, it's pretty much just the blue-gray uniforms we have in game now. However there's at least one other option -- the Clone Medical Officer in his grayish-white uniform. This could be the default, and would go well with the healing Command ability that every Officer starts out with. Then the blue-gray Clone Naval Officer uniform could be available at rank 20. 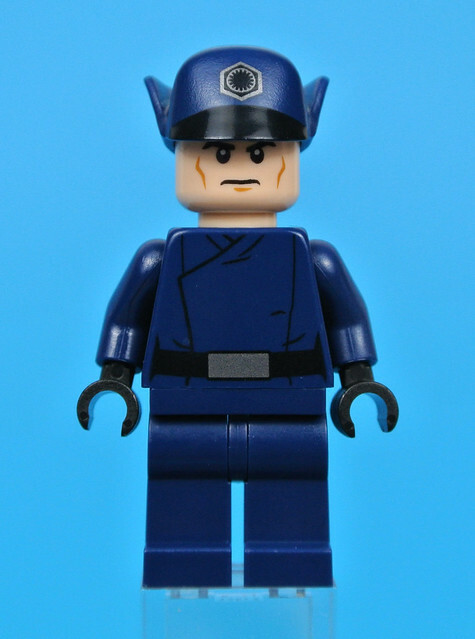 The Droid Officer in canon is also minimally diverse. There's no canon fix that I'm aware of, but one option might be a sort of graduated marking system -- just yellow shoulder markings at first (default), then shoulders and torso (class level 30), then shoulders and torso and the circle on the head (class level 60). Another Imperial option is to include ISB operatives as Officers. The ISB Officer in a white uniform jacket with black trousers might be available at class level 50, while the ISB Commander in dark crimson might be available at class level 70. The current blue-and-tan default Rebel Officer skin, like the Imperial, is for some reason the high-ranking option. I suggest an all-tan version of this, the Lieutenant, as the new default. Then in the middle tier would be the Alliance Captain's uniform, which we've actually seen in-game as Leia's bodyguards in the 2015 Battlefront, perhaps available at class level 30. And the blue-and-tan Alliance Commanderuniform, wearable by Rebels of Major rank or higher, could be available at class level 60. The First Order uniform is the only one that is already appropriate for a default -- black uniforms denote a First Order Squad Leader, or possibly a Sergeant. A gray color-change gives us the First Order Captain, available at class level 30. And a dark teal-blue color-change would give us a First Order Major (or Colonel), available at class level 60. And making it dark grey would give us a First Order General or Admiral, possibly available at class level 90 if it ever goes that far. The default Resistance Officer should, I think, be the Resistance Medical Officer, in a dark brown vest over a white shirt. After that, a similar skin at a similar level is the Resistance Lieutenant, in a tan uniform with a brown vest and a red "dot" insignia (class level 5). A Resistance Captain would have an all-tan uniform and a red "I" insignia (class level 30), and the Resistance Major would have a light brown vest over a white shirt and a red "V" insignia (class level 60). These are all simple, easy-to-make skins that even by themselves would give a lot of depth to Officer customization. You went with more details than me, but I had thoughts about officer customization too. Made about about it. I like this a lot. Someone please @ the devs. I don't know what Battlefront II is. Currently, the Officer class doesn't get armor. This is ostensibly to distinguish them visually from the other classes (though the Droid Officer is very hard to tell from the Assault Droid). While this works fine for the Imperials whose officers frequently led troopers in uniform, and is basically okay in the other factions, there really is no good reason they can't have armor options too, and still be visually distinguishable from other classes. As usual, they've painted themselves into a corner in this regard too. The main distinguishing characteristics for armored Officers in Star Wars are pauldrons, as well as kama and helmet visors for the Clones. And of course those have all been already handed out to other classes. Clone Heavies have been given the kama and helmet visor as well as a small pauldron, Clone Specialists have been given a medium pauldron, Imperial Stormtrooper Heavies have been given the black Corporal pauldron, First Order Stormtrooper Heavies have been given the black Sergeant pauldron, and the First Order Aerial has been given the red Captain Pauldron. Now, there's two lines of thinking about this conundrum. On one hand, they could just leave it, and say that in order to be a Heavy or an Aerial trooper you have to achieve one of the low officer ranks. 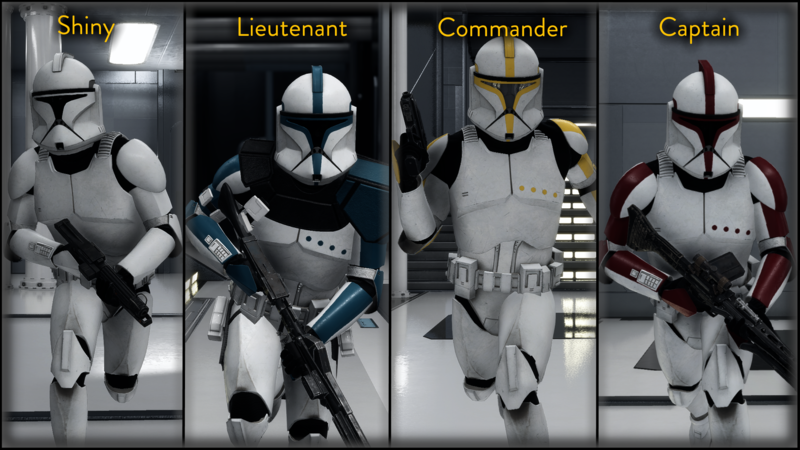 In the same way that the 2005 Pandemic Battlefront II had green-stripe Sergeants as Jet Troopers, blue-stripe Lieutenants as Heavies, and red-stripe Captains as Snipers. On the other hand, though, if visual distinction is so important then it might not be the best idea to have two or three of the other classes given the Officer's signature visual element. My suggestion is this: remove the Officer elements from the other classes and give them to the Officer class. In most cases they can be replaced with elements that provide at least as much visual distinction. 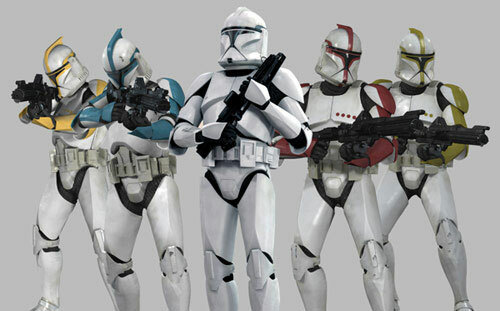 For example, all Clone Officers with armor would have no helmet, to allow easier distinction from other clones; this also allows customization of head or face tattoos as seen in the show. 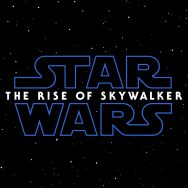 The Clones have two sub-eras, phase-1 and phase-2. 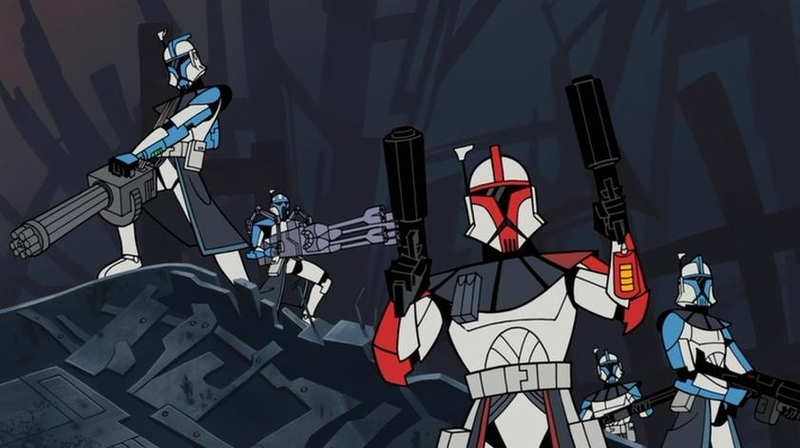 In phase 1, clone Officers were designated by color stripes -- green stripes for the Clone Sergeant (available at class level 15), blue stripes for the Clone Lieutenant (available at class level 35), and red stripes for the Clone Captain (available at class level 65). The armored Officer for the Imperial side is simply the Stormtrooper with a pauldron, color indicating rank. For Imperials, a black pauldron indicates a Stormtrooper Corporal or Squad Leader (available at class level 15). A white pauldron indicates a Stormtrooper Sergeant (available at class level 30). An orange pauldron indicates a Stormtrooper Captain (available at class level 50). And a red pauldron indicates a Stormtrooper Commander (available at class level 70). 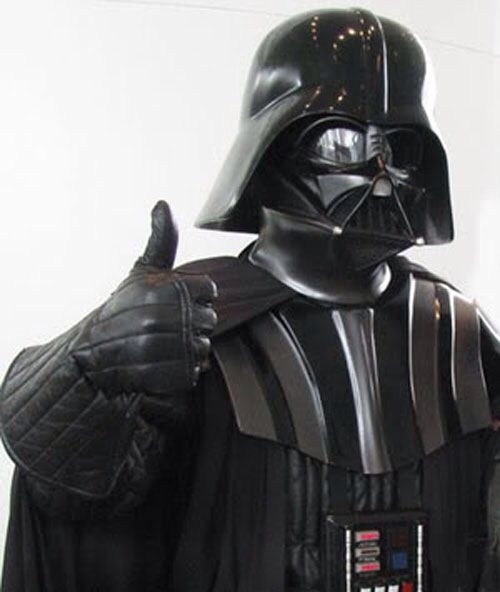 The Imperial Officers could also have an option that combines the uniforms and some light armor. 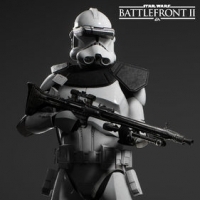 There could be a Field Armor option for the black-uniformed Stormtrooper Officer, for the olive-uniformed Army Officer, and for the Grey-uniformed Navy Commander. 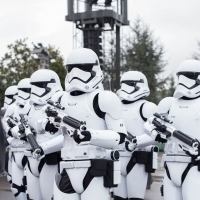 The armored Officer for the First Order side is also just the First Order Stormtrooper with a pauldron, color indicating rank. But the First Order color ranking works differently; they reverse the black and white pauldrons and omit the orange entirely. For them, a white pauldron indicates a First Order ST Corporal or Squad Leader (available at class level 20). A black pauldron indicates a First Order ST Sergeant (available at class level 40). And a red pauldron indicates a First Order ST Captain (available at class level 60). 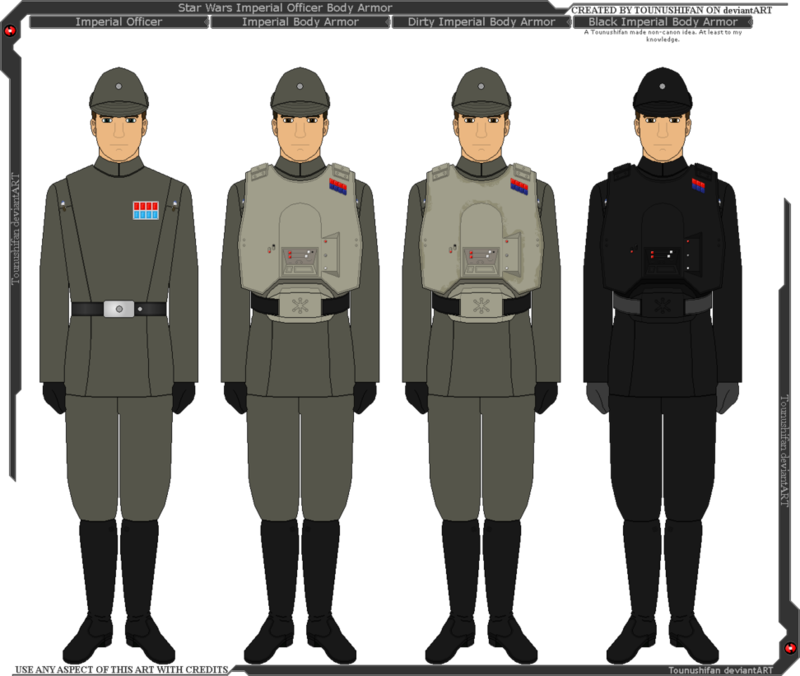 IOA1 - Stormtrooper Officer, armored - CL20 - Common - the normal black uniform with a chest-plate and a flared helmet. IOA2 - Imperial Army Officer, armored - CL40 - Uncommon - the normal olive-drab uniform with a chest-plate and a flared helmet. 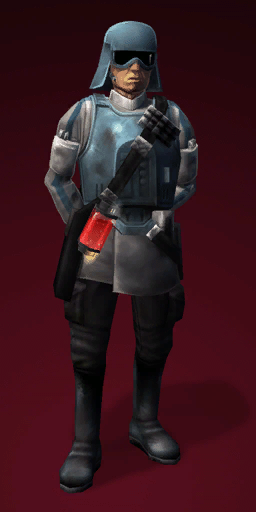 IOA2 - Imperial Navy Officer, armored - CL60 - Rare - the normal grey uniform with a chest-plate and a flared helmet. i feel the legion skins r pointless until we get more maps and heroes from the pt! Yep, I figure clone customization should include a bunch of markings -- symbols and fills and other stuff as well as stripes. Along with the straps and pouches and ammo bands etc that all factions should get. Of course, the color of the markings (the legion) should be default by map. IMO, the kama (belt-skirts) should be reserved for only ARC Troopers and the one highest-ranking Epic Officer skin (the ARC Captain, in the above list). yeah some stuff should be for the arc trooper designs only. i like the stripe colors bc it would allow us each to choose our own color and not look out of place. its like the clones in the 2003 clone wars show. maybe have certain colors be locked to certain classes. something like these should be fine if we dont have enough maps and heroes for the legion skins. Now that we've covered the uniforms and the armor, there are various miscellaneous customization items that would work well for the Officer. This section relies on two assumptions: first, that customization will include the ability to add and change small parts, and second, that Pilots will not have their own place as a Reinforcement and will fit well as an aspect of the Officer class. 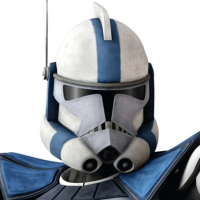 Since this writeup gives Clone Officers armor without helmets, their faces are still visible. 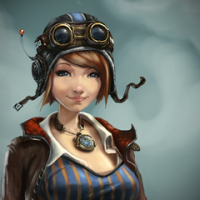 This allows for a variety of face and head tattoos, as well as different hair options. There could be certain armor markings reserved for Officers, which would of course show in the legion-color of the map being played. Kama (or belt-skirts) are available for those who distinguish themselves, though not the long black kama reserved for the ARC Troopers. Pilot skins are a good addition to the Officer class, unless they get their own spotlight as a Reinforcement class. To be a Pilot one often has to achieve a certain rank. And while there may only be three alien heads available for Rebel and Resistance Officers, I hope that the aliens of the other classes will be made available outside of class for a higher price or class-level requirement. All in all, these Miscellaneous customizations could be omitted entirely with little problem, but I think they'd be good to include. I main officer, just put 5 silver stars in a circle on my collar and I'm good to go. The beetle-helmeted guys? I'd love to see those guys, but they weren't Officers. They were Imperial Navy Gunners. I have another writeup placing them as a mid-level Heavy skin. 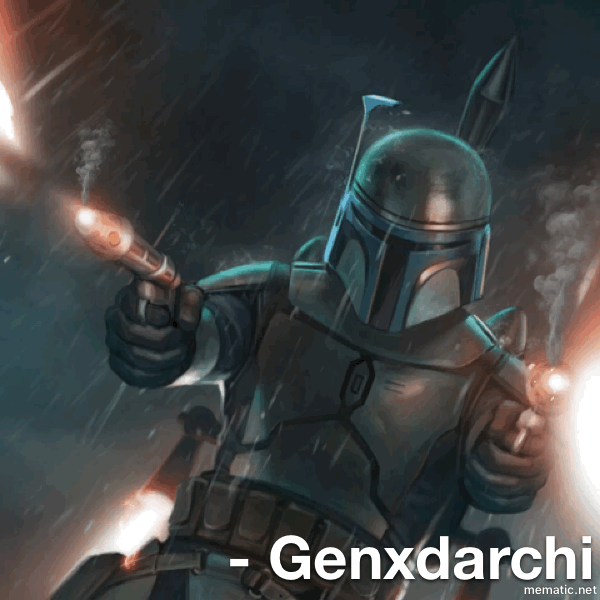 You don't like the idea of markings for Clone customization? These would be great -- they were my first idea for the Officer class, before the beta. But there are problems. 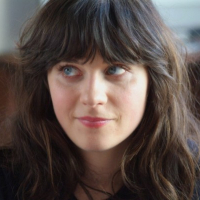 First of all, it would require making an entirely new model, which is enough extra work to make it less likely. 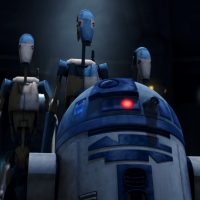 But even if they do make it as an alternative for the OOM Officer, they'd best make it fairly high level, or you'd see TX-Series tactical droids taking up a quarter of the droids on the field, and they aren't nearly that common. Maybe CL60 for the Tactical, and CL70 for the Super Tactical? 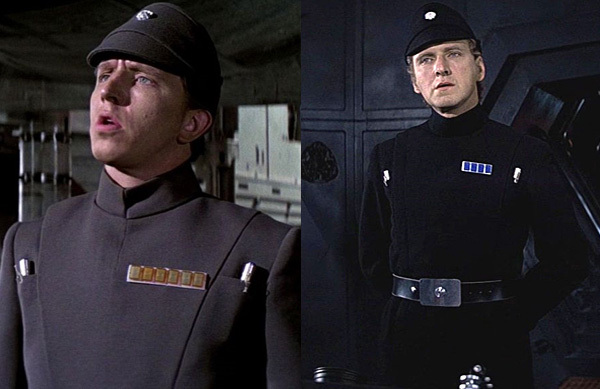 Why have the different Imperial uniform colors, but not the different uniform colors of the Rebel, First Order, and Resistance Officers? There's lots to choose from. 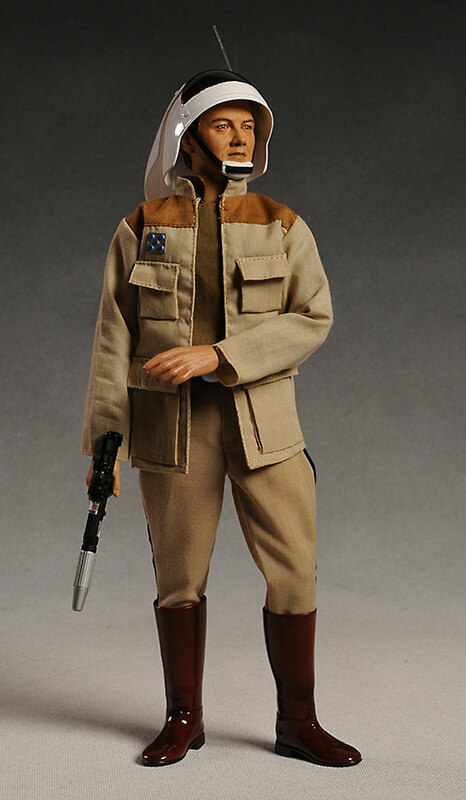 The Rebels have the all-tan uniform, the tan-jacketed Captain, and the blue and tan Commander uniform. The First Order has the black Squad Leader that's currently in the game, plus the gray Captain and the blue Major. And the Resistance has the tan vest, the all-tan, the brown vest, and the current all-brown, as well as the Medical Officer with the armband. i like the stripe colors bc it would allow us each to choose our own color and not look out of place. maybe have certain colors be locked to certain classes. 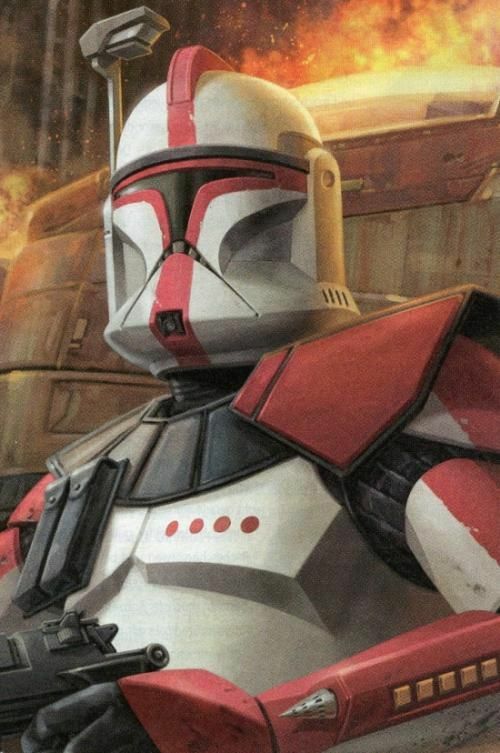 The stripes you're talking about were for Officers only, and were only seen on phase-1 armor. 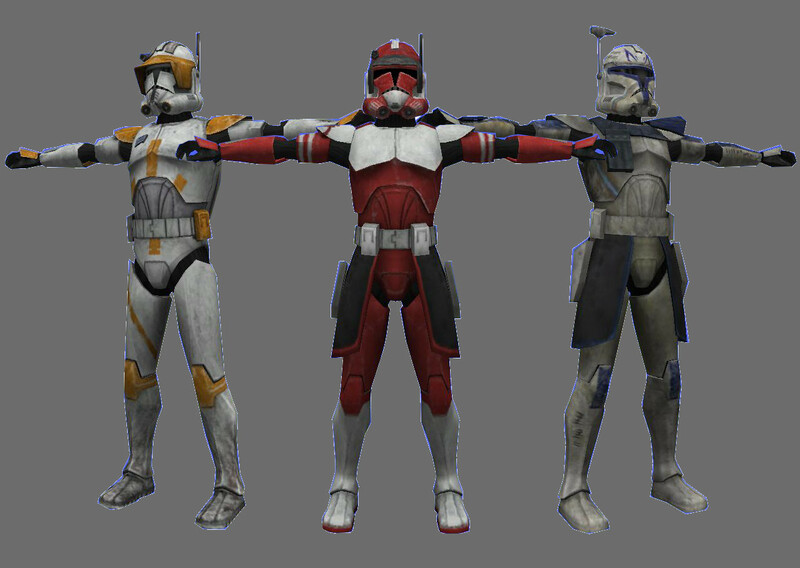 So they'd be great for Kamino, but only for the Officer class, and you'd want them ranked to show class level -- green stripes for Sergeants (class level 20), blue stripes for Lieutenants(40), and red stripes for Captains (60). That's how I put them in my part 2 post above. Yellow stripes indicate a Clone Commander, like Cody or Bly or Gree or Thire. The one we saw in Attack of the Clones was Ponds, the Commander of Mace Windu's 187th Elite. Those are ARC Troopers -- they're called the Muunilist Ten. The one in red is an ARC Captain. The clone medic and naval officers are not what was used for ground combat. 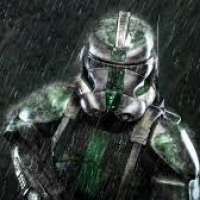 They need to put in real armored clone officers. Once again, a community member who has better ideas than DICE are currently showing. @JackTHorn, you are a legend. 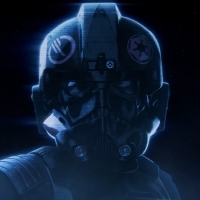 If they introduce pilot skins, I think they should be for the officer class. I tend to agree, but I don't mind them if they're just low-level early skins, they're okay. As players increase in rank, their officer skins will rank up too. Thank you! Coming from a fellow of great ideas himself, that means a lot. 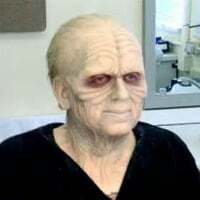 It looks like you’ve put more thought into officer skins in this post than the entirety of Dice put into any cosmetics over the last 6 months. I've got a few more in the pipeline. Stay tuned. I have posts in the works for customization for the other classes too, as well as revisions for my previous posts on Recon and Specialist reinforcements. We'll just have to see if I can find the time to work them up and post them. The main point of this post was the Part 1 section -- 20 new canon Officer skins, all of which should be super easy to make because they just consist of recolor ingredients, or at most porting over a skin that already exists in the 2015 game. I also think these Rebel Officer skins could be used. 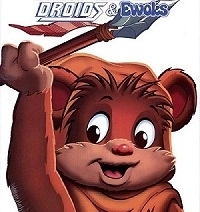 They appear on Yavin 4 in the celebration scene too. Those are really cool, I hadn't seen those before. Which officer ones are you talking about specifically? The only thing I really want is to play with a female (human), especially for the Assault (and Heavy) class. Some days I feel like sitting among the group and buffing/healing. Other days I feel like running the front lines. It would be nice to indicate which days I'm feeling like what, with specific apparel that matches my mood. Just a low-ranking Imperial Army Trooper, with some bacta and a designation marker. Maybe the Empire doesn't value healing enough to give it a commission? In the same way they didn't provide their TIE fighters with atmospheres / life support systems / shields? 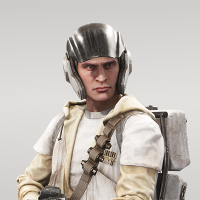 *Thinking back* What did the Empire's medical staff even look like. Something I'll have to explore more later. Until then, a nap is order. *Edit* Just saw the post above. Some Imperial Officers with the similar uniform to Krennic would be cool. Idk if that's the ISB, I thought it was some kind of research department. Gunners could be cool, we see them on the Death Star and I think on SKB, although Clone Gunner could be an alternate skin for the Heavy. Overall, these are some great ideas. @F8RGE idk if you're the right person to tag but can you pass these on/share the thread with the right people? Some Imperial Officers with the similar uniform to Krennic would be cool. Idk if that's the ISB, I thought it was some kind of research department. @JackTHorn , great post as usual sir! I like the depth/detail you went into and especially the Why this needs to be implemented. It’s one thing to request something, but it’s says a lot about a person when the detail and reasoning is eloquently explained. That’s Passion. @F8RGE , please pass this along for Consideration. 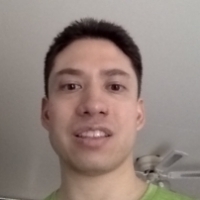 A bit long to read, but I still gave you a like and you get my full support! Loving your ideas! Such a shame stuff like this isn’t in the game. Can someone @ the devs? I already Tagged the EACM. A lot of awesome ideas! You have my support. This is so good, my hat’s off to you. I just wrote such a long response to this during my lunch break, and then the forum ate it. Will try again after work. Nicely rendered! Let's see, only two comments for the officers: First, the coloration on the Naval Officer looks decidedly more Army olive drab than Naval gray, but that's just a nitpick. Mainly, if it were me making it, I'd have it be Stormtrooper Officer (black, default), Army Officer (olive, class level 20), ISB Officer (cream, class level 40), and Naval Officer (gray, class level 60). 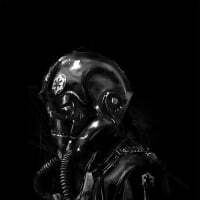 A Fleet Admiral seems too lofty to do much on the ground, there are what, maybe 20 of them in the entire Imperial military? Could be a viable option for class level 80 or so, if they increase the level cap. Also, it occurs to me that they need to retire the field armor element they have as a default Imperial option for Yavin IV, and make it an option for all the Imperial Officer variants. Though maybe the Naval Commander (and the Admiral if we go that far) should only have field armor variants, as they're high ranking enough that they might not be likely to go into the field at all without armor. The red pauldron has an upgrade for the heavy Trooper is a neat idea. I assume that's from the video game that had Stormtroopers with red pauldrons as Grenadiers and those with blue pauldrons as Snipers? I've often considered those for inclusion in my write-ups, but ultimately I decided against them. Mainly for two reasons: 1) You run the risk of ending up with a rainbow array of Stormtrooper pauldrons, which aside from looking silly goes against the black white and red aesthetic of the Empire, and 2) I believe the red pauldron in canon is now the Stormtrooper Commander, senior to all the other pauldrons. I like the idea you put in there, with the black-pauldron Enlisted / Corporal and the Orange-pauldron Captain as upgrades for the Heavy. Interesting thought. I tend to prefer pauldrons as options for Officers, but they're not a bad fit for Assault, really. Takes the pauldron from being an Officer rank element to being a mark of the upper ranks of regular troopers. And really, it's better than where the pauldrons are now - on the Specialists and the Heavies, for some reason. If officers can't have armor and pauldrons, then maybe Assault should have them as rank markers, that would actually be pretty great. But I still have some nitpicking about it, because I'm me. 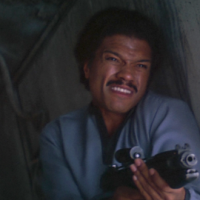 Mainly, I'm curious why you skipped the white-pauldroned Stormtrooper Sergeant? Of the four Imperial pauldrons, the two that aren't clearly Officers of separate high rank are the black (Corporal/Enlisted) and the white (Sergeant). Seems like it would be best to either A.) make all four of the pauldroned Stormtroopers Assault skins, B.) make the Corporal and the Sergeant Assault skins and the Captain and/or Commander Officer skins, or C.) make them all Officer skins. Also, since canon seems to favor the Death Trooper over the Shadow Trooper ever since Rogue One, I'd say the top-level Assault skin should either be the orange-pauldroned Captain or (my preference) the gold-striped Nova Guard Trooper. That pic is exactly what I wanted, I would’ve rather had that than different races, maybe we can have both. Every wildfire starts with a spark. Your concept is HUGE, detailed, well-written and brillant. Certainly, the officers are the most boring troopers (in terms of outfit) but with what you said, they could be cool too. Thanks! 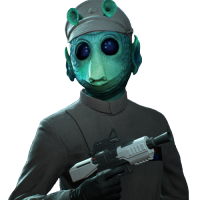 I really think that, with the minimal effort of recoloring alone, the Officer skins could be really great. Having them tied to rank would be even better, or at least priced by the rank of the skin. I've seen that skin, and I like it. 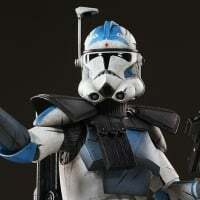 I didn't include it because I like having Phase-1 Clone armor on Kamino, and would prefer the stripes in green, blue, and red for Officers of low, middle, and high rank. Though now I think of it, I think there may have been phase-1 versions of the Kamino Security. Maybe they could be the default for Aerial clones on Kamino?